They were unfailingly polite despite my stumbling at times. 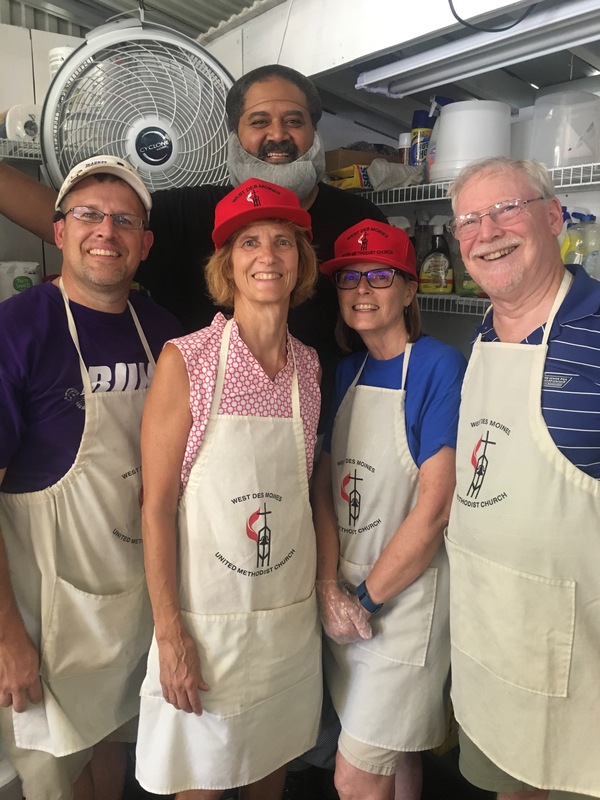 I made my debut as a volunteer server last Friday at the West Des Moines United Methodist Church food booth at the Iowa State Fair. By most standards, the Iowa State Fair is one of the five best state fairs in the United States, having drawn a record 1,117,398 fair-goers in 2015. That’s one-third of the entire population of Iowa, which was 3,350,000 in 2016. I confess that I had never been to a state fair before, and I had only been to one county fair when I served as pastor of a county-seat church in Michigan. I had no idea what to expect in Iowa, other than the three things that I’d heard over and over. 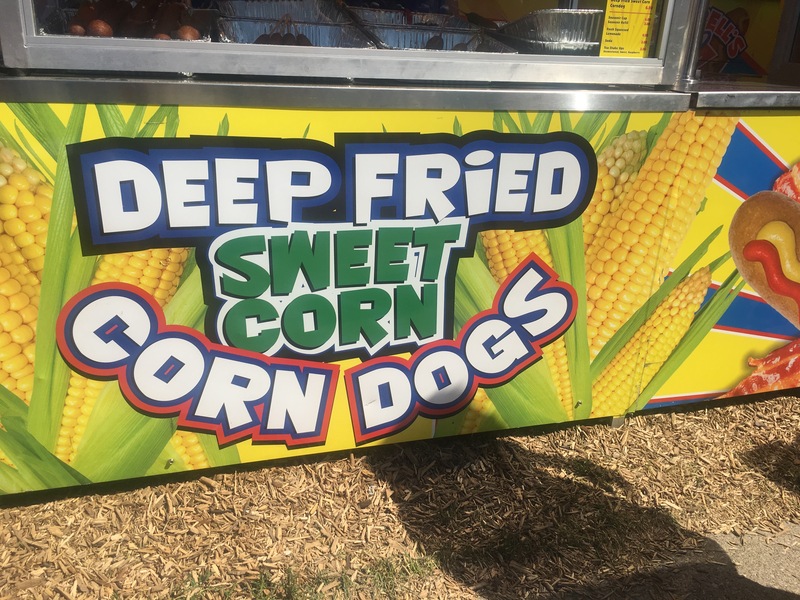 Most of the food is deep-fried and is “on a stick.” And these 75 varieties of “on a stick” foods are not particularly healthy. Coney dogs on a stick, Oreo cookies on a stick, double-wrapped bacon coney dogs on a stick, cherry pie on a stick, pork chop on a stick, candy bars on a stick, deep fried Thanksgiving turkey balls on a stick, shrimp corn dog on a stick, and what grieved me the most: deep fried fresh fruit on a stick and deep fried sweet-corn corn dogs. The fair is very family-friendly. The winners of the Best in Show pigs and cattle are REALLY big. In decades past, there was a “street” at the fairgrounds called “Church Row.” This is where many area churches operated “dining halls” at the state fair. One by one and for various reasons, these churches decided not to continue to serve at the state fair. In 2017, West Des Moines United Methodist Church is the only church to operate a concession at the fair. This is their 68th year! The church built a permanent structure for their concession in 1975. The West Des Moines food stand was originally started by women in the church, with the men taking over in 1954. After the 2016 fair, the men needed help, so today, the stand is now a mission project supported by the entire church. It’s a huge undertaking! In the beginning, there were only two requirements for concessions at the state fair: you had food, and you could sell it. There are many more regulations today for operating a food stand, including added labor laws and tighter health codes, plus upkeep of the stand itself. Various fair committees in the church seek workers, set the menu, and take care of the details of running a restaurant that serves food sixteen hours a day in two shifts (6 a.m. to 10 p.m.), over eleven days with 245 volunteers. In addition, two people stay for a few hours after 10 p.m. every evening to clean up. People of all ages help, even youth. And when all is said and done, every cent that is raised goes toward fulfilling the church’s call to be difference makers in mission and ministry around the world. In my conversation with Pastor Cindy Hickman, I simply asked if I could visit West Des Moines UMC’s food booth during the fair. She was delighted and said that Gary and I were welcome to volunteer at the church booth on Friday while she was there. That way we could have a taste of what the fair was like from a food perspective. As I put on a church baseball hat and apron and wash my hands, I remember back to my junior and senior high school days when I often served as a waitress for wedding receptions at my church. My friends and I were usually given wedding aprons as gifts for our service (not really usable for any other occasion! ), and occasionally they gave us each $2.00. The pace is intense. Customers keep coming and coming. They know our prices are very reasonable, and we want to serve them quickly and well. Keeping track of orders and payment is a challenge at times, but the volunteers remain cheerful and work together like a well-oiled machine. Many customers don’t even want to take the time to sit down and eat. I chat with Jerry Slagter, the day manager. He arrives between 5:00-5:30 a.m. and leaves around 7:30 p.m. Managing a crew of sixteen along with a hired cook, Jerry says the stand is even busier than last year. 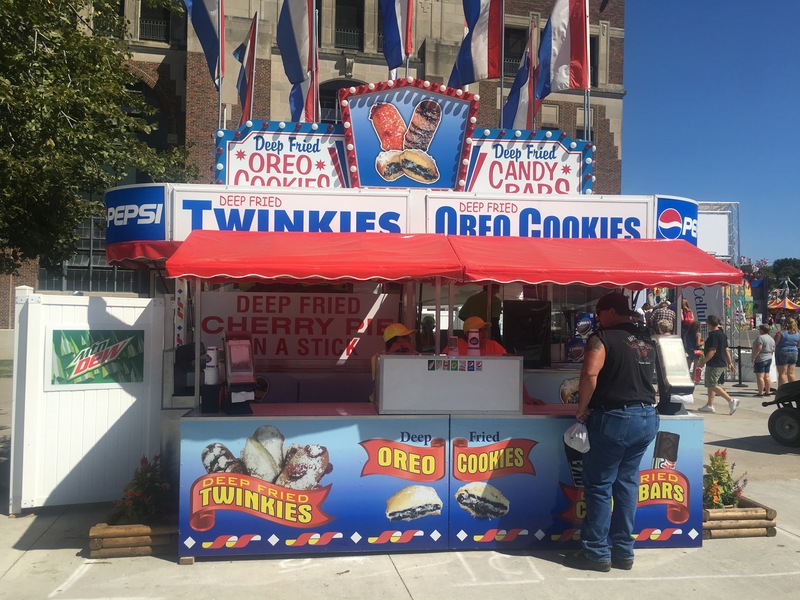 It could be because of the beautiful weather or the great publicity they received after the Des Moines Register published a front-page feature article on the church’s food stand the Sunday before the fair. Jerry also says that a lot of people who come ask about the church and are very complimentary. “I’m so sorry we’ve run out of ground beef. We’re really busy today, but we’ll have more beef burger combos and walking tacos in about twenty minutes if you want to come back.” They often wait. The blessings of West Des Moines’ food ministry at the state fair are many. Is this a fundraiser or a ministry? Why, it’s both! Church members have a way to serve the public. Through the food booth, church members build community with each other and develop friendships as they work together. The food booth is an entry point into the church for new people who yearn to make a difference and are invited to volunteer. All the money raised from the food booth goes to worthy ministries around the world. Volunteers have an opportunity to witness to the love of Jesus Christ through their interactions with customers, including the prayer stick ministry. It’s not until Gary and I pause to eat pulled pork sandwiches that I remember about the prayer sticks. 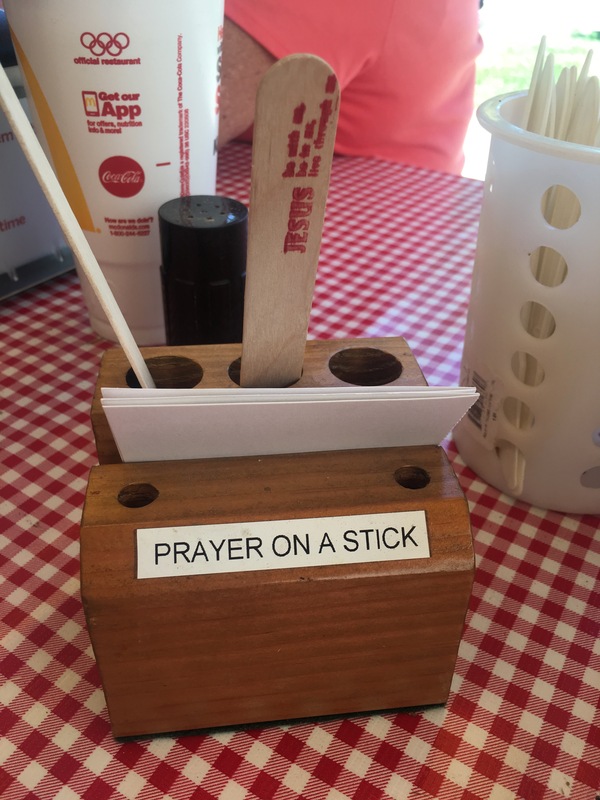 At the picnic tables, there are small containers with a prayer printed on tongue depressors that serve as prayer sticks. There are also pieces of paper on which customers can write prayer concerns, which are then prayed over by church members. I pray for the increasing tension and escalating rhetoric between North Korea and the United States. God, may you soften the heart of Supreme Leader Kim Jong-un, as he threatens the world with nuclear missiles, and may you give wisdom to President Trump and his advisors, that they would seek first to engage in diplomatic efforts for a peaceful resolution to the issues that are dividing our countries. I pray for the farmers in Iowa, as a deepening drought threatens many of their crops and is resulting in lower yields and dried up pastures used to feed cattle. I pray for The United Methodist Church during this time when the Commission on a Way Forward is discerning a way for United Methodists to worship, serve, and witness together in the midst of our differences around human sexuality. In light of the violence in Charlottesville over the weekend, I pray that each one of us would renew our own commitment to work for peace and justice at the same time as we name and resist hatred, prejudice, and bigotry in whatever forms they present themselves. Thank you, West Des Moines United Methodist Church! I am thankful that your example reminds us that Jesus has called each one of us to be a servant leader who models grace, courage, and hope for our world. May you continue this witness and ministry for years to come. What a wonderful mission and ministry. I can’t imagine the work that goes into this. I am sure God is using this for His glory! Blessings to all. The next thing you need to attend is the Old Thresher’s Reunion in Mt. Pleasant over Labor Day weekend. There is a Church Row there with the Mt. Pleasant UMC in the forefront with that great food. Not nearly as many people as the Iowa State Fair, but just as much fun. 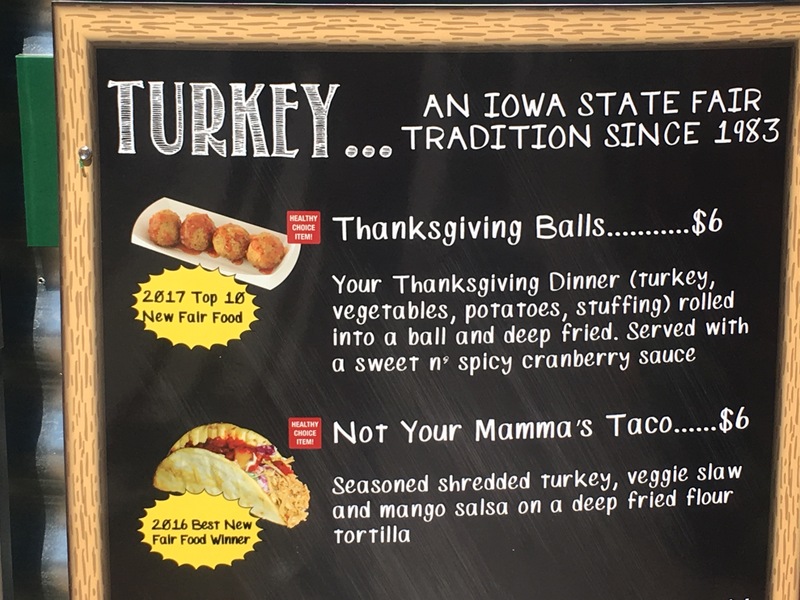 I’ve never been to the Iowa State Fair but hope to some day. Old Thresher’s–many times over the past 50 years. Bishop Laurie: How excited I was to see you when we stepped up to order a walking taco at the fair. I love how you celebrate life’s experiences and use them all to reflect back Jesus and His intentions for us. In my life as Mrlethodist (65 years) I don’t think I’ve ever even been near our Bishop and it seems God has you in front of us all the time!! Thank you Bishop Laurie for participating in our fair ministry. Working is sometimes mind boggling, but worth the time spent. We always need volunteers and post the opportunity on the Conference website. I feel as if I were at the fair myself. I’ve been to the Michigan State fair many times, but I must admit it was more fun as a child. I’ve never had the opportunity to work one. I agree working with others increases the pleasure and decreases strain. Once again Laurie, you have hit on many of the issues that I am praying about. Thank you for putting them in perspective, and relating those concerns to everyday events. It was great fun getting to work with you on Friday. I am new to this church and that was my first stint as a volunteer at the food stand. I am sorry I was a crummy teacher. This whole thing; the stand and the Bishop volunteering restores my faith in all that is good and right. I think we offer sort of a safe haven at the Fair. Good people. And if you want to help again, come on out Saturday morning. Jo, it was a joy to be your partner on Friday! Thank you for your patience with me. It was a fabulous experience. No one will ever know the number of people who will have been positively impacted by the West Des Moines Food Stand at the fair this year. Thanks be to God. What a wonderful ministry. Oh, Laurie, you continue to make me smile…this blog was priceless, full of fun, and also seriousness that we all need to be on our knees in prayer to pull together as a people and as a country. What a delightful commentary of the fair – I’ve never been, but I know the church makes an impact on the fair-goers with their food and their commitment in serving the customers. Praise the Lord! After reading this blog, I wanted to volunteer to work a shift at the Iowa state fair. But, too far so I will keep volunteering at places meaning a lot to me with a renewed sense of vigor. I did volunteer at a booth for the Kent county youth fair for an organization where, we too, work to share the good news of the gospel. Very exciting, Laurie!